PARIS, France (PAMACC News) – Availing climate information to households on the ground is one of the best ways of adapting to climate change; delegates at the 21st session of climate negotiations (COP21) have been informed. Speaking at a side event on the eighth day of the negotiations in Paris, scientists, lawyers, policy makers donors and members of the civil society observed that there exists a gap, which makes it difficult for climate information to flow from the scientists and members of the community. “Not long time ago, farmers could easily tell particular dates when good rains for planting would start, and how long the rains would last by just using indigenous knowledge,” said Augustine Njamnshi, the Policy Coordinator of the Pan African Climate Justice Alliance (PACJA) “But today, the good rains for planting are totally unpredictable. They can come earlier than normal, or they may delay,” he told the participants. 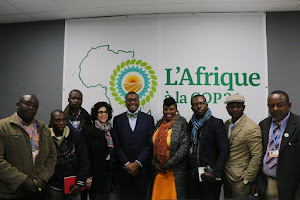 It is based on this that the Africa Development Bank (AfDB) is now financing organisations that can help African communities access climate related information. In Kenya for example, the bank has given Maseno University a grant with which to implement a flood management project to build the capacity of Busia County government institutions and community organisations. We are working closely with communities on the ground, tapping their indigenous knowledge on how they usually adapt to the perennial flood situations, while at the same time engaging both the county and national governments in terms of policy environment,” said Denis Opiyo, the project coordinator. The expected project outputs include a flood risk analysis and mapping system; training of county government institutions and community organisation officials; documentation of indigenous traditional knowledge on coping and adaptation; and strengthened community-based flood disaster management system. This project will provide flood risk information targeting women and the youth for enhanced livelihood resilience. Another output of the project is to increase access to climate information by community groups mainly women and youth through participatory community engagements for improved livelihood activities. Dr Koko Warner of the Institute for Environment and Human Security based at the United Nations University in Bonn said that for such a project to success, there is need for collaboration between scientists, meteorological departments, policy makers, and above all members of the community. “Farmers on the ground fail to develop when rains come early or late. They suffer because they do not have information about the climate,” she said. Providing weather services therefore helps farmers and households prepare in advance, which makes them cope effectively with the situation, whether floods of drought. “It is also important to involve members of the community right from the planning stage of such a project, because communities know how to adapt to climate change,” said Dr Dr. Saleemul Huq, the Director for International Centre for Climate Change and Development (ICCCAD). He pointed out that poor countries were the first to develop the National Adaptation Programmes of Action (NAPAs), which under the United Nations Framework Convention on Climate Change (UNFCCC) provided a process for Least Developed Countries (LDCs) to identify priority activities that respond to their urgent and immediate needs to adapt to climate change – those for which further delay would increase vulnerability and/or costs at a later stage. However, he warned that the donor community should be careful when funding projects in Africa because on paper, they look bankable, but some of them are absent on the ground. The event’s objective was to bring together policy makers, climate change experts and donors to discuss strategies for policy formulation, resource mobilisation and implementation of projects to address the gap between climate science and action programs to address vulnerability to climate change impacts at the community level. The fundamental problem is not that green energy has positive spillovers — running your A/C on solar power doesn’t make others better off — but that brown energy has negative spillovers. Thus, when we subsidize green instead of taxing brown, we end up making electricity too cheap overall. I hope by using some best thesis writing service students can improve their academic performance.